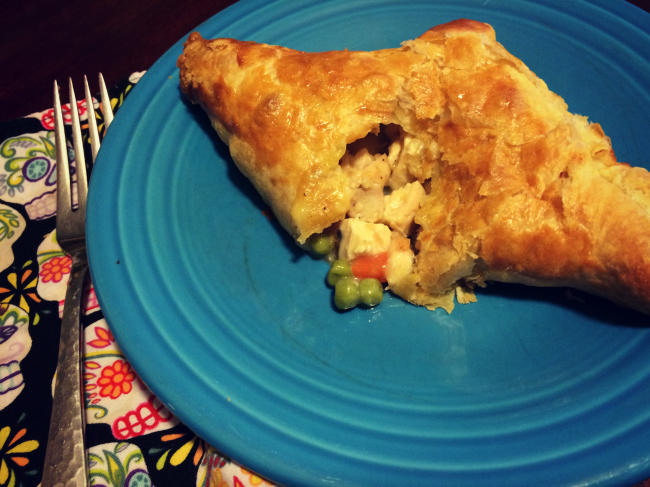 Recently I had a hankering for some chicken pot pie, so I tinkered around with a few recipes I found until I made it just right! I do not like when Chicken Pot Pie is too mushy and full of sauce. I like it to be full of meat and vegetables in every bite with a nice crispy crust. 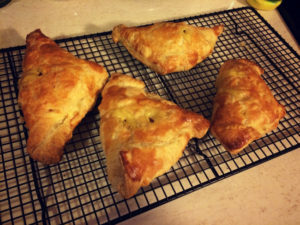 I found a recipe for Chicken Hand Pies and I tweaked it to make an Easy Chicken Pot Pie recipe that my whole family approved of. These were super easy to make and they reheated really well. As a matter of fact, they were so easy to make that my youngest did the measuring and mixing. They call for cooked chicken, and I had planned to just bake the chicken breasts, but Michael decided to grill the chicken. And I have to say, I think the grilled chicken added great flavor to the Chicken Pot Pie! 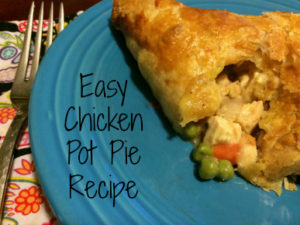 This easy Chicken Pot Pie recipe is perfect for a busy school night. 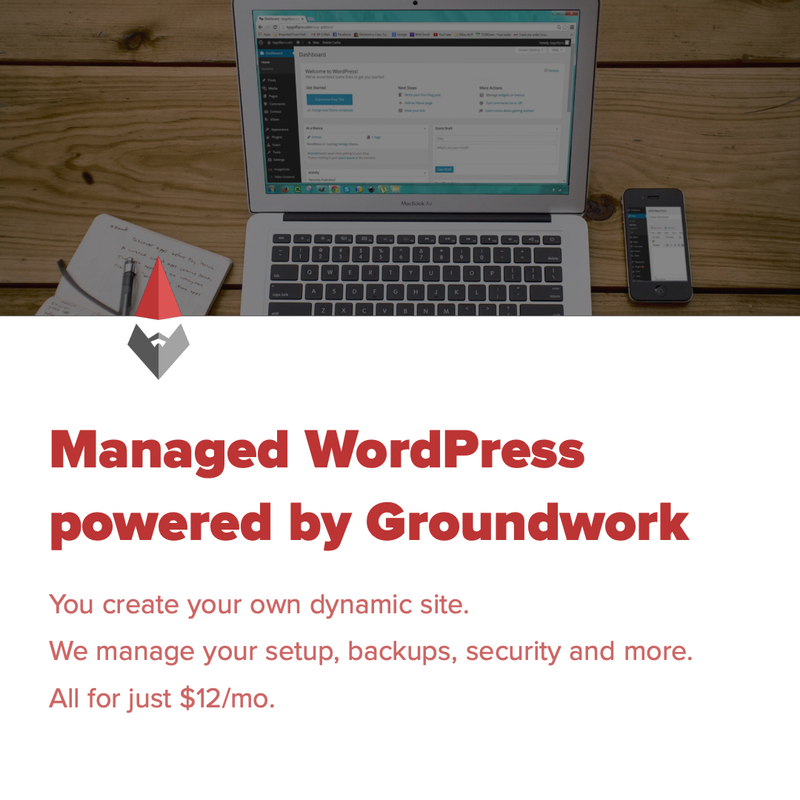 Let me know what you think after you try it! Preheat oven to 400° and line a cookie sheet with parchment paper. In a mixing bowl combine soup, frozen veggies, chicken, salt and pepper. Stir to combine. Roll the pastry out on a floured surface and cut each sheet into four squares. 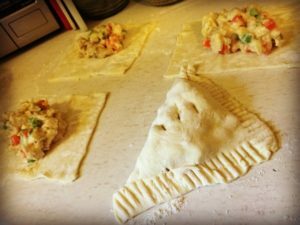 Put 2 or 3 spoonfuls of the chicken-veggie mixture in the middle of each square and then fold the pastry into a triangle. Crease edges with a fork and then poke some small holes or slits on the top of each pie. Brush egg over the pies. Bake for 30 minutes, cool then enjoy! For reheating, microwave for 25 seconds and then toast in the toaster oven for a few minutes.